Watch out, Sacramento! Deliciousness is in town and it’s out to get you. A new doughnut shop opened today. Is it doughnut or donut? These babies were so good, I’m going to use the longer word out of respect for the ‘bot. Either way, the place was open for 3 hours and sold out. Being an early riser has it’s privileges . I was lucky enough to score 1/2 a dozen doughnuts to see what a fancy one tastes like. Doughbot offers both regular and vegan deep fried pastry. I bought a vegan apple fritter to see if my mom could even tell the difference. She said it was denser than the usual fritter, but that was a good thing. 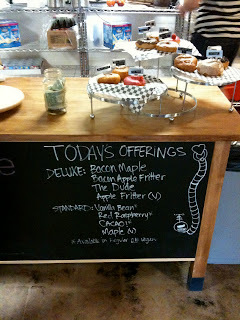 I’m still not sure how a doughnut is vegan, but maybe it’s better to just enjoy the food than to dissect it. You see that one with the slice of bacon on it in the photo? Yes, that is bacon on a maple doughnut. That was my favorite. The Dude was pretty good too. It’s a Big Lebowski inspired confection. I had forgotten what a real doughnut is supposed to taste like. All of them were of the raised variety, but so much richer and denser than the offerings at the local grocery stores. Let’s face it, Sacramento just doesn’t have enough doughnuts…donuts are in abundance, but real yummy doughnuts are few and far between. My only complaint was that there is just never enough bacon. Am I right guys? Then again, I think my taste buds were in shock. Things you might want to know before going in: Yes, they do take credit cards. They have a fancy iPad that swipes you card. It’s confusing to someone running on no coffee and little sleep, but then again, what isn’t confusing at 6:30 in the morning? There is only street parking, but the neighborhood seems to have plenty of it during the early morning hours. It’s located on 10th Street between W and V. Is that still Midtown? It’s just two blocks from the 10th street exit off the west bound Capital City Freeway. >I would happily OD on The Dude. Yum yum yum.